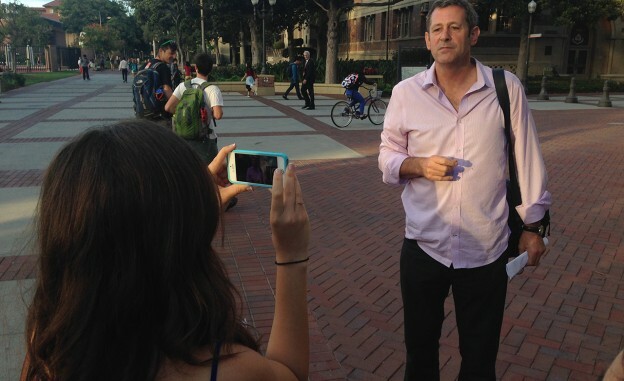 USC broadcast journalism instructor John Cyrus Smith shows the Fall Digital News Immersion class at USC how to do a standup. Photo by Amara Aguilar. Our first day of class this semester was sort of like a first date. It was a little awkward, but filled with excitement. It’s not that I hadn’t had many first days of class. I’ve been teaching for nine years and first days don’t really give me butterflies. But this was my first time teaching with two other instructors in the same classroom, and my first semester teaching journalism at USC. Just days before the class started I had met broadcast instructor John Cyrus Smith and print journalism instructor Nomi Morris in person. The three of us were assigned to teach a Fall Digital News Immersion course together as part of a new nine-month master’s program in specialized journalism at USC. Instead of students taking separate classes in broadcast, text and digital journalism, the courses were converged into one. 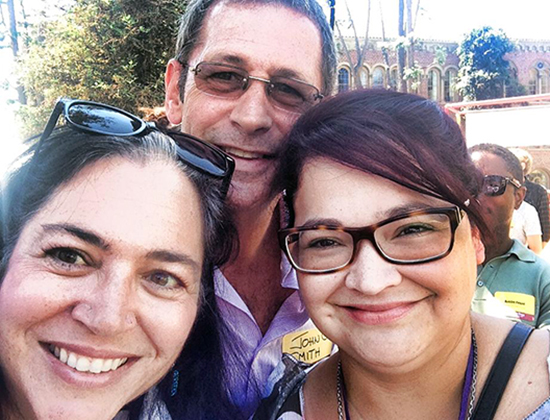 USC instructors, from left, Nomi Morris (text), John Cyrus Smith (broadcast) and Amara Aguilar (digital). Photo by John Cyrus Smith. We had a good plan for the first day of class and felt we were ready to go. Our first day went well overall, but it was definitely different than any other first day of class I ever experienced. I had never taught with two other instructors in the same classroom before. I had co-taught classes, but this was different. All three of us were so enthusiastic and had something to say. We wanted to talk about our three areas: Broadcast, text and digital. We tried not to interrupt each other, but it was inevitable. We needed to get our groove, but we all knew we were on our way. One of the best things about this experience is that while we are teaching our students, we are also learning from each other. My background is in academia and digital journalism, but I never knew what a “VSV” was until I heard Smith explain it to our class. (A VSV is voice over, sound on tape, voice over for a broadcast piece). “It’s so great to be able to learn from colleagues who have specializations and to be able to point out the similarities and differences as they come up in the classroom,” Morris said. I have become a more well-rounded instructor because of this experience. My colleagues have too. 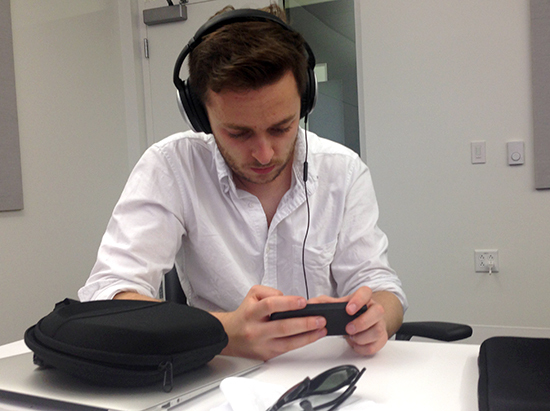 Graduate student David Hodari edits video on his mobile devices. Photo by Amara Aguilar. Recently for class, I taught a session on shooting and editing video with mobile devices. Students were assigned to shoot some video outside of the classroom, come back and edit and publish their videos on the fly. Smith went out and did the assignment with the students and for the first time, edited video on his phone. For the students in the program, the environment in the digital immersion class is definitely unique. While it’s nice to have three instructors in one space, we really have tried to make sure we don’t confuse students or overwhelm them. 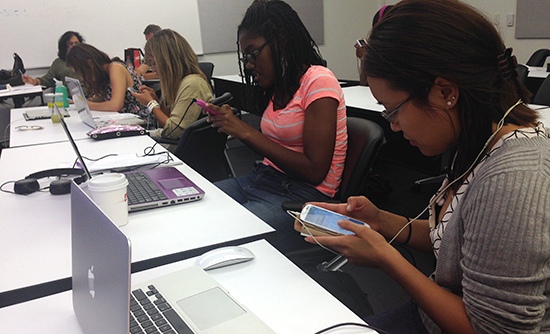 Students in USC’s Fall Digital News Immersion course edit video on their mobile devices. Photo by Amara Aguilar. In addition to gaining instruction in the Fall Digital News Immersion course, students also are required to work a full day’s media shift every week in the new student Media Center in Wallis Annenberg Hall at USC. Below a plethora of new digital flat screens, student journalists sit side by side producing content for student media outlets that include radio, TV, web, mobile and emerging platforms. The concept of convergence is at the heart of this state-of-the-art newsroom, which opened for the fall 2014 semester. Inside the core of newsroom, there are no physical walls. No cubicles. No silos. That concept has been infused in the master’s program and has carried over into the classroom and curriculum. “The intent behind it was to kind of break down the walls between the different types of journalism we were teaching,” said Vince Gonzales, who is the coordinator of the nine-month master’s program at USC. So far, Gonzales said he has seen the efficiency. For example, leads used to be taught in separate classes for print, web and broadcast. Now, instructors build off each other to teach all formats together in the same space. “People were confused when they were taught leads differently in print and broadcast classes. When we taught leads together we didn’t see that confusion,” Gonzales said. The program isn’t perfect of course. Feedback and surveys are being closely examined to adapt and improve the curriculum. Even now, we are considering adjustments for next year’s program. This experiment in the classroom has taught me several things. Embrace the unknown: We aren’t afraid to admit when we don’t know something outside of our area of expertise and jump in and learn along with the students. Learn to adapt: With three experienced instructors in the room, everyone wants to contribute. We’ve learned to adapt, work hard not to interrupt the flow of the class, but balance that with complementary instruction. We also make sure to assign someone who is the “lead” instructor to portions of the class. Have a plan: Before every class we draft a plan as any instructor would. We make a rough outline, but we pay attention more than the usual attention to time. We always seem to run out of time, but we have learned to adapt and be flexible if one of us runs over. Planning is also important so we don’t confuse the students when switching topics or disciplines. Don’t be afraid to experiment and fail: After every class, Morris, Smith and I talk about the class session. We talk about what went well and what didn’t. We’ve tried things that haven’t worked and built on the concepts that have been successful. We have especially found that short lectures, hands-on assignments, and group critique keep students more engaged. Embrace change: I know this is obvious, but we have all seen even more so that we need to change the way we teach from this experience. Just as the news industry has evolved and needs to continue to change, so do instructors. Our classes no longer feel like a first date, but more like a long-term relationship. It’s no longer awkward with three instructors in the classroom. That passed pretty quickly. We’ve gotten to know each other better. We’ve got chemistry, but we worked for it. There are still times when we interrupt each other, but we are more conscious of it and wait for the right moments. We are evolving and learning from this experimentation in the classroom and loving every minute of it. We know there will be bumps in the road, but we’re in it for the long haul because we are growing from this experience and most importantly, we are doing it for our students. Here’s a sample of in-class exercises from the Fall Digital News Immersion course. Real-Time Drill: Students watch a pre-recorded news event and live blog & tweet (offline) their own coverage of the event and then write a short story or news brief with highlights and quotes as if for the Web. Mobile Assignment: A mobile technology live assignment, possibly outside the classroom. Or a Real-Time Drill: Students go to an event or speech on campus, listen to a guest speaker or watch a pre-recorded event and use mobile apps to create coverage and write a short story or news brief as if for a mobile site/app. Lead Assignment: write lead-in & package scripts with video and sound provided. Crime Story Assignment: Writing exercises with police & crime stories that include headlines, tweets, text, audio, video and graphics (news conference fact sheet). Standup Assignment: Standup shooting assignment or Live Shot drill for aspiring video journalists and nervous text reporters who need this skill today. Graphic Assignment: Create an interactive graphic in class for a story you are working on or one that has been published by Media Center outlets using the various online tools you have been trained in (map, timeline, etc.) and your advanced writing skills. HTML Assignment: write, code, upload Media Center shift work including photos and video. Build an HTML table. Data Assignment: Turning a number-heavy story into a story with impact about people. Different best practices for Web, mobile, audio/video, and text. Sports Assignment: Real-Time Drill: Students watch a pre-recorded sports or entertainment event and live-blog & tweet (off-line) their own coverage of the event and then write a short story with highlights and quotes as if for the Web. Amara Aguilar is an associate professor of professional practice in digital journalism at USC Annenberg. She previously was the journalism department chair and an assistant professor of journalism at Saddleback College in Mission Viejo, Calif., where she advised student news publications and led the journalism program’s mobile and tablet initiatives. Amara loves journalism, education, and all things tech.